Sweeping view of Tampa Bay facing west - Luxury Florida Real Estate PhotographyI believe the view of Tampa Bay from the Apollo Beach side is best because, for one, it faces west allowing for prime viewing of Florida's amazing sunsets. Another reason that may only bother me is that there is a large electric plant on the Apollo Beach side. So if you live on the St. Petersburg side this small spot of smoke stacks jars what is otherwise a flawless view. It would slowly drive me crazy. Of course if you live on the Apollo Beach side, then you have to be neighbors with the power plant. Hmm, which would you choose? This luxury home in Apollo Beach had a great "backyard" for entertaining, i.e. no grass, an infinity pool and expansive covered and uncovered seating areas. Personally, I would take a grassy backyard over pavers and a pool any day because I would want a place to run and play with beloved puppy Kiki. Plus I am a recluse and never entertain. However, if you are the opposite of me, as most people are, this type of space would be ideal. All along the back of the house are a series of sliding glass doors that all open in a cascading fashion into a pocket in the wall creating a completely open feeling to the great room as if Tampa Bay itself flowed to the doorstep. 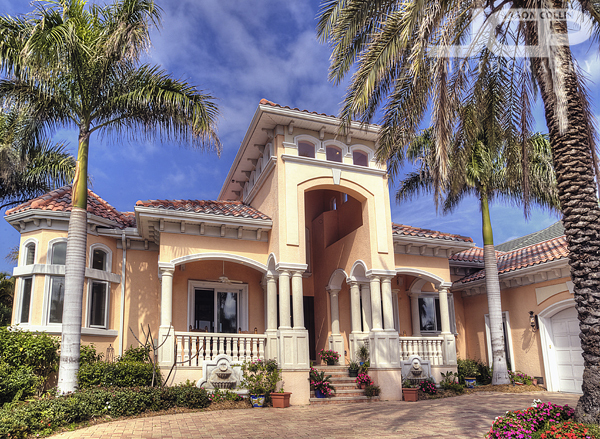 Estate-like Apollo Beach Home grand entrance - Luxury Florida Real Estate PhotographyRoyal palm trees do their best to create a curb appeal for the home to try and keep up with the million dollar water views from the back. I think the front definitely holds its own.